On Friday 3rd and Saturday 4th of August, Hull hosted the eighth annual and biggest ever Humber Street Sesh. The ‘Sesh’ has grown to become a much anticipated staple on the city’s summer calendar. Across Friday evening and Saturday tens of thousands of revelers enjoyed the festivities with over 200 live music performances, dozens of bars and food stalls as well as craft and clothing stalls - there really was something for everyone. 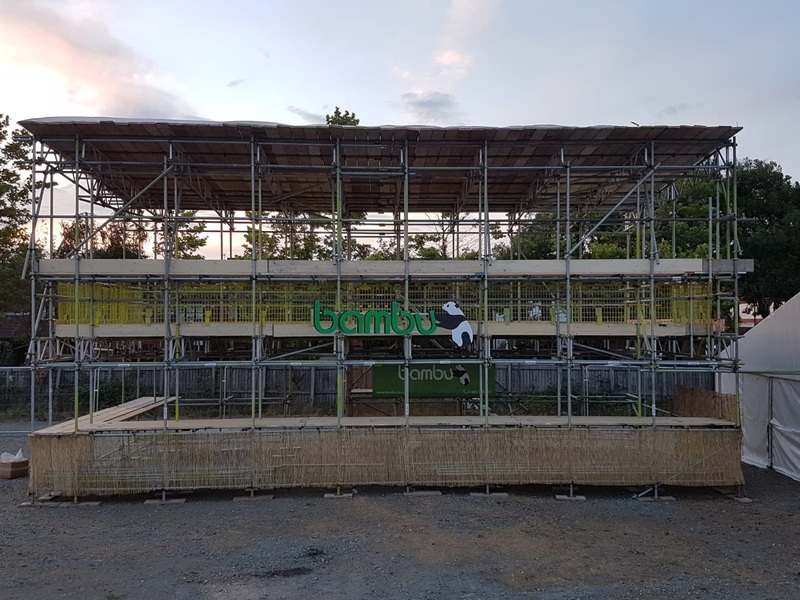 Bambu are very proud to have been able to provide the event with our biggest scaffold bar yet, which even included an upstairs standing area. The bar was in prime location next to the ever popular silent disco, which provided a very convenient stop off for thirsty attendees! In the week running up to Humber Street Sesh many of our team donated their evenings to help get the bar up and looking good. Throughout the weekend we received an abundance of positive comments about the bars originality, which our lads were thoroughly proud of. It was a great experience for us all to come together on a project especially when we rarely get to all work together. The evening before the ‘Sesh’ we hosted our quarterly team meeting where we discuss many areas of the business and tackle the big questions like ‘who is more important, the customer or the scaffolder?’. During the meeting we also gave our awards out for Panda of the Quarter and Most Improved Panda. The awards were won by Tom Parsons and Mike Graves who work as a part of the same gang. The team were also given some exceptional feedback that has been collected from our customers over the last three months. Into the weekend the bar was buzzing on Friday night as everyone arrived full of anticipation for the evenings antics. It was great to see so many of our staff, clients and suppliers come down to experience the event and join us at the bar. There was a consistently large crowd all evening, and in spite of the occasional spot of drizzle; everyone still had a great time. For the main event on saturday, everything got underway nice and early at 11am, many families attended with their excited children, for some it would be their first experience of the ‘Sesh’ and the live music. As the day progressed the crowd continued to get bigger and bigger, culminating in running some of the bars dry. From all of us at Bambu, we would like to congratulate everyone associated with Humber Street Sesh for putting such an incredible festival and anyone who came down to the Bambu Bar to join us for a pint.